Presented together for the first time, here are all-time favorite Car Talk calls that run happily off road, veering into the amazing world of science, where Tom and Ray actually wield some authority. MIT may want its diplomas back, but the world’s most knowledgeable garage scientists are undeterred in seeking greater knowledge – and laughter. TOM AND RAY MAGLIOZZI, a.k.a. Click and Clack, the Tappet Brothers, are the hosts of NPR’s Car Talk, a syndicated weekly call-in program broadcast nationwide to more than 600 stations and heard by over 3.3 million listeners. 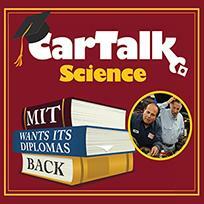 Winner of the Peabody Award, Car Talk has been providing advice on everything from car repair to marriage since 1977.